...... them up to date and interested. 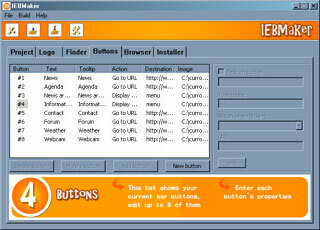 With IEBMaker your company logo will appear as a button that, when clicked, loads a predefined URL. Usually this URL will be your company's site, also your customers will be able to perform searches within your company's website, or on search engines such as Google or Yahoo!. Qweas is providing links to IEBMaker 1.2 as a courtesy, and makes no representations regarding IEBMaker or any other applications or any information related thereto. Any questions, complaints or claims regarding this application IEBMaker 1.2 must be directed to the appropriate software vendor. You may click the publisher link of IEBMaker on the top of this page to get more details about the vendor.